The CellML version of this model has been curated and unit checked by Penny Noble and it is known to run in OpenCell and COR to recreate the published results. The units have been checked and they are consistent. The Zhang model has since been updated by Alan Garny et al. (2003) and this model has also been described in CellML and can be found in the model repository. ABSTRACT: Mathematical models of the action potential in the periphery and center of the rabbit sinoatrial (SA) node have been developed on the basis of published experimental data. Simulated action potentials are consistent with those recorded experimentally: the model-generated peripheral action potential has a more negative takeoff potential, faster upstroke, more positive peak value, prominent phase 1 repolarization, greater amplitude, shorter duration, and more negative maximum diastolic potential than the model-generated central action potential. In addition, the model peripheral cell shows faster pacemaking. The models behave qualitatively the same as tissue from the periphery and center of the SA node in response to block of tetrodotoxin-sensitive Na(+) current, L- and T-type Ca(2+) currents, 4-aminopyridine-sensitive transient outward current, rapid and slow delayed rectifying K(+) currents, and hyperpolarization-activated current. A one-dimensional model of a string of SA node tissue, incorporating regional heterogeneity, coupled to a string of atrial tissue has been constructed to simulate the behavior of the intact SA node. In the one-dimensional model, the spontaneous action potential initiated in the center propagates to the periphery at approximately 0.06 m/s and then into the atrial muscle at 0.62 m/s. The original paper is cited below. 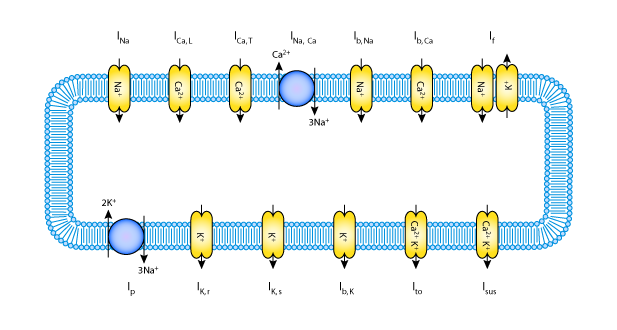 A schematic diagram describing the current flows across the cell membrane that are captured in the Zhang et al 2000 model of the action potentials in the peripheral cells of the SA node. Derived from workspace Zhang, Holden, Kodama, Honjo, Lei, Varghese, Boyett, 2000 at changeset e61df907cc94. Mathematical models of action potentials in the periphery and center of the rabbit sinoatrial node.